The tango. Gaucho crafts. Soccer. Siestas. Argentina is rich in culture, but you need not hop on a plane to enjoy authentic Argentine fare. Located in the heart of the Tacoma’s Sixth Avenue business district, Asado boasts traditional cuisine from the South American country. Loosely translated, asado means “Argentine barbeque” and is a classic method for cooking meat on a grill or over an open fire. A ceviche appetizer is generous enough for two. The tower of mildly sweet tilapia, prawns, and mild, firm sea bass is layered on pico de gallo and topped with creamy, refreshing guacamole. The seafood delicacy is accompanied by an Argentine staple, fried plantains, crunchy and lightly salted. Soft rolls are served with herbed, paprika tinted chimichurri butter. Asado offers the most complete selection of Argentine wines in the Northwest. Malbec is the most widely planted red grape variety, followed by Bonarda, Cabernet Sauvignon, Syrah and Tempranillo. The influence of Italian immigrants has added a variety of Italian varietals to the vineyards. Asado’s beef is all natural Black Angus and steaks are masterfully grilled over imported mesquite wood. Espalda Asado (flat iron steak) is presented over sweet roasted corn polenta finished with a hint of mild poblano chile. Al dente calabasita (butternut squash) gnocchi is served in a rich brown butter sauce, blended with macadamia nuts, wild mushrooms, julienned zucchini and slivered garlic cloves; it is a reflection of the Italian influence on the Argentine diet. Pita Puerco (pork chop stuffed with chorizo, cranberries, golden raisins, almonds, apples, and fennel) and Garron de Cordero (seared boneless chicken breast, caperberry, white wine lemon pan sauce, wilted arugula, and cherry tomatoes) are other entrees to be savored. 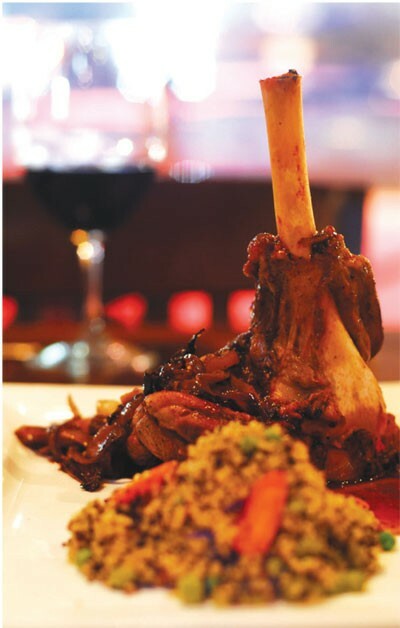 Asado offers the fabulous flavors of Argentina using the freshest ingredients from the Northwest and beyond. Attention to quality, presentation and service makes it one of a kind. For a satisfying meat-loving experience, give Asado a try.